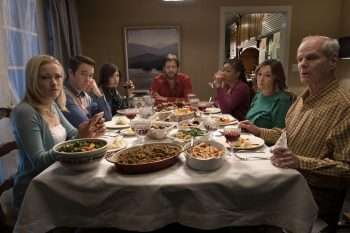 Tiffany Haddish’s (Girls Trip) top notch storytelling skills and infectious charisma should make here everyone’s favorite dinner guest, but in The Oath that simply may not be the case! Set during a family Thanksgiving dinner, the story centers on Chris (Ike Barinholtz who wrote and directed the flick), a 24-hour news junkie who is incensed when citizens are requested to a sign a loyalty oath to the President. Haddish co-stars as Chris’ levelheaded wife Kai who will try to keep the peace with the relatives during their family holiday. Things don’t go as planned, as the aforementioned dinner turns into a divisive free-for-all that leads to a knife to the heart incident and Kai getting tased! John Cho, Nora Dunn, and Carrie Brownstein round out the cast of this political dark comedy. Check out the teaser trailer and tell us what you think! The Oath hits theaters on October 12.